Deionization or demineralization is a delicate and important task for industrial users as well as hospitals and labs, which require ultra high purity water in order to prevent formation of sediments on the surfaces of expensive equipment in labs, on microchips, or on surgical tools thus depreciating their value as well as performance. High purity water systems are especially vital for a number of industrial water users such as power plants and other process plants where a slight variation in water parameters can result in unfavorable results. High Purity Distillation Systems work well for this but are very expensive to buy and to operate. For reduction of unwanted dissolved solids, without the heavy expense, portable deionization exchange tanks (SDI) are life-savers! They are cost effective and very fast and easy to set up and use. Without a high purity reverse osmosis (RO) system as pre-treatment, most portable DI tank systems are two bed (twin bed) deionization set ups in which one bed is a strong cation or acid-exchange vessel and the other is an anion or a base-exchange vessel. For DI systems that are only for polishing after reverse osmosis equipment, please see mixed bed DI systems. For the twin bed systems, the positive ion or the cation is exchanged for an H+ ion. This decationized water is then passed through an anion exchanger where the negatively charged ions are replaced with OH– (Hydroxyl). This high purity water is devoid of nearly all impurities and foreign agents. However, the process doesn’t guarantee removal of bacteria or organic matter. A related article on UV systems provides more detail on removal and control of organics and bacteria. With Service Deionization, or SDI, the inflowing water supply is hooked to the DI tanks and the deionization process takes place instantly until the tanks are exhausted. Any noticeable lapse of time before replacing a tank can result in potential harm to the expensive equipment. Corrosion resistant DI tanks with hydraulic tubing ensure the purity of water in a number of important industries – especially those in which finished products must be washed with deionized/demineralized water to ensure quality compliance. For a list of acceptable pipes for high purity water, please visit our High Purity Piping Guide. 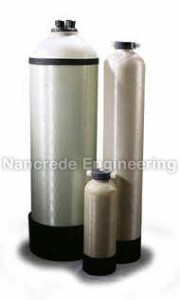 If you have an industrial, high purity or commercial water system that might be in need of DI (SDI & DI Exchange) Tank Replacement service, you can call us at +1 888 56-WATER (569-2837) or email us at info@nancrede.com to learn more.